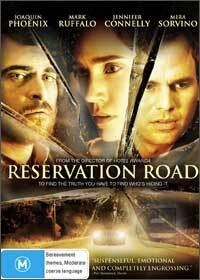 Reservation Road stars Joaquin Phoenix, Mark Ruffalo, Jennifer Connelly and Mira Sorvino in this gripping drama that was directed by Terry George and describes how a group of individuals deal with tragedy in their own unique ways. Based on John Burnham Schwartz's novel, Reservation Road highlights how one decision can irrevocably change a myriad of lives which resulted from the poor choice made after a hit and run. The story revolves around Ethan Learner (Phoenix), a college professor who attempts to focus his anger in finding the person who killed his son, where as his wife Grace (Connelly) focuses all her attention on their remaining child. Needless to say, their relationship is headed for disaster. Whereas Dwight (Ruffalo), the man responsible for Josh's death attempts to cover his tracks and tries to live "normally" with this dark stain on his soul. Director Terry George carefully tells this tale of mixed emotions and how these people are forever and irrevocably entwined that not only explores the human psyche but gives us a gripping drama movie from start to finish. It may be clichéd at times but it will make you think and will move your heart strings.